Prior to IMSA, Dr. Robinson was Program Director at Georgia Institute of Technology Center for Education Integrating Science, Mathematics and Computing (CEISMC). 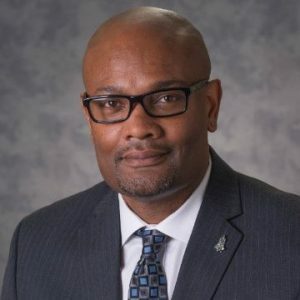 He has extensive outreach experience, including teacher professional development along with engaging student experiences, as an education specialist at NASA Glenn Research Center, National Institute of Aerospace, and NASA Langley Research Center. He gained classroom teaching experience at Tanglewood Middle School in Greenville, South Carolina, Riverside High School in Greer, South Carolina, and Marietta STEM Magnet Middle School in Marietta, Georgia. Dr. Robinson’s expertise in STEM teaching and learning has afforded him opportunities to serve on the Georgia Department of Education STEM Certification Review Committee, as Co-Operational Partner for Georgia First Lego League and on the Committee for a New Vision for Education and Public Outreach for Fermilab. Along the way he has consulted several schools in regard to STEM School Design, many which achieved Georgia STEM Certification. Currently, he is sought by schools and districts to consult them on using Makerspaces as part of everyday instruction. Dr. Robinson earned a Ph.D. in Teaching and Learning/Mathematics Education from Georgia State University. His research focus was integrative STEM instructional design using robotics and 3-D printing. He earned a Master’s degree in Natural and Applied Sciences form Oklahoma State University, holds a Bachelor of Science degree in Mathematics from Tennessee Technological University and studied Physics at the University of Georgia. Dr. Robinson’s research interests are: transformative and innovative STEM experiences, STEM teacher professional development, computational thinking, and Makerspaces. He feels that he has been “called” to teach and it is his responsibility to inspire and motivate teachers and students to be creative, dream the impossible, and achieve the incredible.